George Graham Reviews Chris Thile's "How to Grow a Woman from the Ground"
Since the 1980s, so-called "new acoustic music" has been a hotbed of creative activity. Artists using the instrumentation of bluegrass have been making lots of interesting, often virtuosic, and usually not very traditional sounds. It started with people who grew up in the rock generation like David Grisman and Sam Bush, and then passed to a younger generation like Béla Fleck. Now we are in essentially the third generation of this eclectic acoustic genre, and the group which perhaps epitomizes these hot pickers in their 20s -- who are as wide-ranging in their influences as their predecessors -- is the band Nickel Creek. When they emerged with their first national CD in 2000, the members, then in their teens or early 20s, combined superb musicianship with some imaginative arrangements and a wonderfully wide-ranging palette of influences. In addition to the three Nickel Creek albums since then, the two of the individual members, mandonlinist Chris Thile and guitarist Sean Watkins have been releasing a steady stream of solo albums. And indeed, Nickel Creek announced that at the end of 2007 the group was planning to go on indefinite hiatus for the members to pursue their individual careers. The most prolific of the Nickel Creekers is Thile, who released his first album at about 13 years of age, as a bluegrass prodigy back in 1994. Particularly notable was his 2001 release Not All Who Wander Are Lost, which featured guest appearances by Béla Fleck among others. In 2004, Thile released Deceiver, an all-solo recording that got quite electric in spots. Now he has released a CD called How to Grow a Woman from the Ground, and he returns to all-acoustic music. For this recording, he assembled a regular band who plays throughout the CD, rather following than the usual pattern of varying personnel in such side-projects. He serves up a typically eclectic collection of original material, both vocal and instrumental, as well as covers from unlikely places such as the alternative rock world, with songs by The White Stripes, and the Strokes, as well as an old country blues by Jimmy Rodgers, complete with yodelling. Thile's band on the CD includes guitarist Chris Eldridge, who as worked with Tony Rice, Bill Keith, the Seldom Scene and others. On banjo is Noam Pikelny, known for his work with the Colorado bluegrass jam band Leftover Salmon, and currently touring with the John Cowan Band. The fiddle player is Gabe Wilcher, who has appeared with everyone from alternative rocker Beck to Randy Newman and currently performs in Dobro man Jerry Douglas' band. And on bass is Greg Garrison, currently with Leftover Salmon. All are first-rate players who can easily keep up with the notoriously virtuosic Thile. This CD is also distinctive in that it was recorded live in the studio with just two microphones among all the musicians. So there was no overdubbing or opportunities to fix things in the mix. More on the recorded sound later. While the music on the CD keeps to traditional bluegrass instrumentation, is, as you might suspect from Thile, quite wide-ranging. But, interestingly when he borrows a songs from the rock world, the result is often the most traditional-sounding. 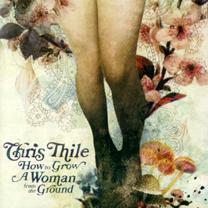 Chris Thile's new CD How to Grow a Woman from the Ground, is an excellent, all-acoustic project from Nickel Creek's mandolin luminary. After getting rather electric on his last solo recording and doing a great deal of overdubbing, this one consists of live performances recorded before just two microphones by a great bunch of young pickers who serve up some creative original compositions as well as drawing on existing songs from alternative rock to old-time country and transforming them in novel ways. The recording technique is notable and quite audible on this CD. While the vintage German condenser microphones from the 1950s give a very natural and open sound, the mix is dependent on the relative positions of the musicians to the mics. Lately a number of notable bluegrass musicians such as Del McCoury have taken to performing that way with minimal miking. The problem with this recording is that the vocals often sound distant, and the acoustics of the studio where the recording was made become apparent, and they are not the best, adding a kind of coloration. The dynamic range, the span of volume between the soft and loud passages is fairly good. So we'll give the CD a "B-plus" grade. Chris Thile's new CD once again shows that he remains one of the truly bright lights on the new "new-acoustic" music scene. (c) Copyright 2006 George D. Graham. All rights reseved.